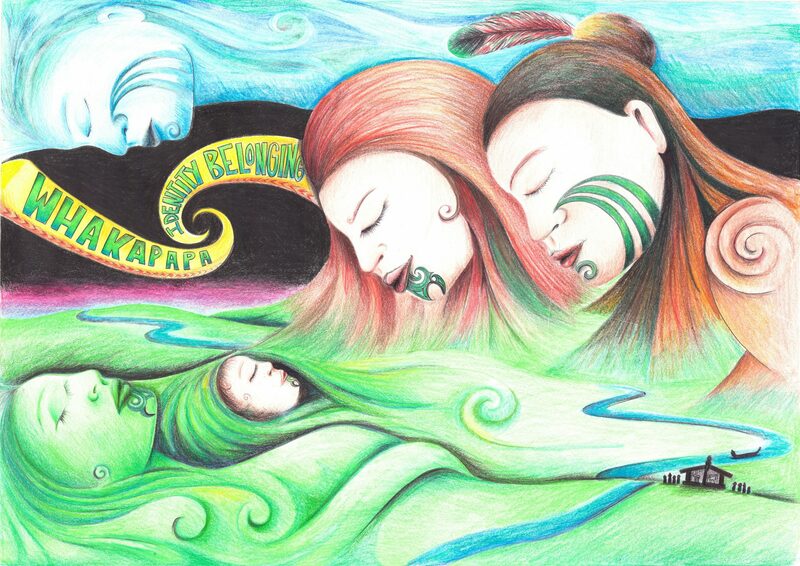 The words, ‘Whakapapa’, ‘Identity’ and ‘Belonging’ unfurl on a banner that binds a mother and her pepi with their tane and tipuna in the most popular design in the E Tū Whānau poster competition. Ngatoia Skipper-Whaanga Pincott’s design attracted 700 votes, almost twice as many as her closest competitor, to win the Most Votes section in the 2018 competition. She says the design for her poster came to her as a vision. Ngatoia (Ngāti Raukawa, Rangitaane, Kahungunu, Ngāi Tūhoe, Rongowhakaata, Te Aitanga-a-Maahaki, Rakaipaaka and Rongomaiwahine) lives in Gisborne and works with her family’s trust, Mauria Te Pono Trust as the Kaihanga Rauemi, developing resources to help whānau find tools and create strategies to help them with alcohol, drug and other social issues. She says that her own journey into te ao Māori started 13 years ago when her baby sister, nieces and little cousins started at kohanga reo in the Manawatu.